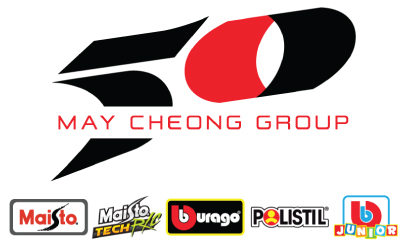 THE MAY CHEONG GROUP CELEBRATES 50 YEARS! HONG KONG, (JANUARY 2017)— The May Cheong Group, manufacturers of the famous die-cast and radio control replica brands Maisto and Bburago, slot-car and track set maker Polistil, and Bb Junior, a new range of preschool vehicles, is enjoying their 50th year of producing and distributing toy products in 2017. MCG was established as May Cheong Plastic Toy Factory in Hong Kong in 1967 by brothers P.Y. Ngan and Y.C. Ngan. Later joined by P.Y.’s wife Katherine, the firm quickly set out to make toy products for many important companies throughout the industry. Eleven years after their inception, the company produced its very first die-cast toy and the very first motorized die-cast vehicle in Hong Kong. Today, fifty years later, the company is well known throughout the industry as one of the leaders in hobby and toy vehicle production, having produced well over 1 billion toys during it’s lifespan.